SRC51, adt-audio's new Mixing Console for Surround Sound was designed with respect to todays use of an analog audio mixing system in a digital studio environment. It is optimized to be used as an analog front end and back end for any DAW at a very high level of dynamic range and sonic performance. Apart from the technical performance, the system offers everything for recording, editing and mixing, clear upgrade paths, and a very attractive cost-value ratio. 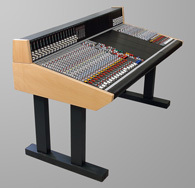 The SRC51 audio mixing console covers the range from a rack-mounted 8 channel mixer up to a 64 channel console for analog recording, editing and mixing. The entire analog work station includes surround facilities not only with the control room monitor section but also in the main mix bus. The input channels are equipped with a fully featured 5.1 panoramic section with LCR-Pan, Front-Surround-Pan, LFE send and Divergence Control. The Surround Mix Master unit has a build in Stereo Downmix Matrix to allow normal stereo operation without the need to readadjust the 5.1 panoramic section. The most important device of the surround console SRC51 is the input/output-module S3-IM5, which includes a routing buss amp and a quasi inline structure. The implementation of these features makes it possible to use the IM5 in many different modes. Audio recording while using the same channel for monitoring the output of a track is possible with or without the internal processing devices. In addition to direct recordings from one channel only, there are 16 busses that can be used for recording and of course for audio subgrouping and additional aux sends as well. The buss amp output can be assigned to the channel output if the group is used for recording. If it is used as an audio subgroup, the buss amp can be assigned to the input of the unit or to the input of the monitor chain. With this combination it is possible to use the entire module as a groupmaster, or to use only the monitor chain as a group master and the rest of the channel either for recording in direct mode or to feed the 'Tape' or 'Line' input to a mono or stereo audio subgroup. Since the electronic section of the mic preamp is a piggy back card, modules can be delivered without mic preamps at lower cost. The control elements of the mic pre are always installed. An upgrade is possible at any time without additional cost. The Processing Section of the modules combines a hi-pass low-pass filter and an 4-band-EQ with 2 fully parametric bands that cover the frequency range from 60 Hz to 15 kHz. The shelving HI EQ can be used in the standard mode to produce silky sound or - by pressing the 8k switch - to force the range around 10 kHz with a very soft bell characteristic. The LOW EQ works always as a medium Q bell and is adjusted to the selectable center frequencies 60 Hz or 100 Hz. The switched Insert Section is located post the EQ and the PRE switch moves it pre EQ, Post Filters. 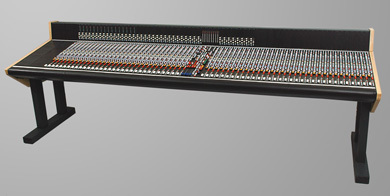 A Dynamic Processor can be installed in the meterbridge of the SRC51 mixing console. An additional wiring frame in the bridge allows to daisy chain the channel insert with the installed dynamics units. This feature offers the additional opportunity to insert dynamics processing sections anywhere at any time. The wiring is universal; also stereo channels will operate in that frame slot. Alternatively a high resolution peak meter in mono or stereo versions can be installed. The TKC-DN combined Compressor / Noise-Gate Unit is now available. Within the next months, more units will follow. We are also planning to make a combined meter / compressor expander. 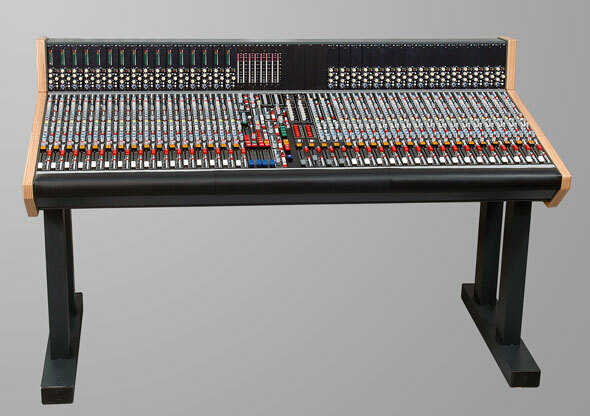 The Master Section of the SRC51 mixing Console is divided into a total of 4 different modules. Two of these units, the master MS5 and the control room unit, must be installed, the other devices, the studio playback device and the talkback/Oscillator unit are optional. Based on this principle, it is possible to configure a very small, rack-mounted analog mixing console with 8 channels, the master and the control unit. This model is a unique Rack-Mixer, since it has all the advanced features listed above and naturally the ability of analog audio mixing. Besides the conception of the SRC51 makes possible to install the playback and the talkback unit only, if these functions are needed.